The following is the introduction to a series of talks I gave in Red Deer on April 12-14, 2013, on creation care. This text provides the gist of what I said, but of course I riffed a bit. I also had PowerPoint images to go along with this talk. Note that when I talk about creation, I am in no way disparaging evolution. One can affirm creation and evolution, without doing too much damage to the definition of either. I opened with a story that I did not write down, about my bizarre encounter with a strange neon blue marine worm in Halifax, NS, in which I picked up this creature and accidentally dropped it. Its body burst in two, white liquid poured out, and then its smooth face curled up in my direction, its face peeled back and this white puffy flesh emerged. On the end of the flesh were two black, curved fangs. Needless to say, I ran away pretty fast. Only later did I learn that these polychaetes turn a bright blue during the breeding season. They swim to the surface, where part of their body detaches and explodes in a shower of gametes. The white flesh I saw was its esophagus, which it shoots out of its mouth to impale its prey. Here’s one of the central questions I want to ask this weekend: why in the world did God create that bizarre worm? Was it a practical joke? A punishment for human sin? Was God bored? I think that if we can answer that question, we will have arrived at the basis for a creation ethic. I’m curious – how many of you have heard a sermon on environmental care before? Why do you think that is? I will let you ponder that question to discuss afterwards. The Christian media reinforced this for me. My concern today is that you have been raised in this particular Christian culture, and that when I say the word environmentalism it will have these connotations of fanaticism and anti-Christianity. My concern is that you view creation care as harmless but nutty [here I showed some funny pictures of environmental advocates], or maybe not so harmless [here I showed a picture of a woman holding a sign calling for suicide to save the planet]. But when I talk about creation care, you need to realize that this is not the type of environmentalism that I’m talking about. I’m not talking about worshipping the planet as divine. I’m not talking about hemp-wearing hippies smoking pot while hugging trees. I’m not talking about people who think that abortions are pro-environment because they cull the human herd. What I am talking about is a Christian environmental ethic that is a much-needed corrective to the environmental movement as it currently stands, and a much needed corrective to people like Ann Coulter and Pat Robertson who are frankly out to lunch on what the Bible has to say about the environment. Creation care takes a middle ground between two extremes: the secular environmental group, and the Ann Coulter dominion view of creation, in which we can do whatever we want to the created world. Why am I here to talk about creation care? I am not an environmentalist. I am not some hippie. I don’t know where my clothes were made. I love a good burger. I am not a paragon of virtue for environmentalism. I’m here because of my time at Alberta Bible College, when, against my will, while studying scripture, I became convinced that there was a strong biblical mandate to care for creation. I didn’t want this to be true. I was comfortable living my non-green life. But I was convicted, and slowly my wife and I are changing the way we live. We’re nowhere near tree hugger status yet, but maybe we’re getting there. I’m also here in part to defend Christianity. In 1967 Lynn White Jr published an influential essay entitled ‘The Historical Root of our Ecological Crisis’. The historical root of this crisis, argued White, was Christianity, for two main reasons: first, Christian theology says that humans are above all of creation and can therefore use and abuse it. We saw this in the Ann Coulter quote, but there are numerous other instances of this, from Pope Pius IX forbidding the opening of an animal protection office in Rome, because he felt that Christians had no duties whatsoever towards the animal world, to the influential theologian Thomas Aquinas, who wrote ‘It is no wrong for man to make use of animals, either by killing or in any other way whatever.’ The reasoning is that we are, after all, God’s chosen creations. In other words, animals are nothing but our playthings, our tools, our objects, to be used and abused as we see fit. With nothing but God above us on the hierarchy, we are free to do what we want to creation. Secondly, Lynn White argued that Christians de-sacralized nature. The ancient pagans had more of an Avatar-like relationship with the natural world, where they would not dare cut down a sacred grove for fear of divine wrath. But the early Christians went out and cut down those groves, to prove that trees were just trees, there was nothing divine or sacred about them. Once this relationship with nature had been established, technologies could be produced to exploit the natural world. One can only build a bulldozer if one thinks the items being bulldozed are not God, and Christianity made huge inroads in removing God from the world. The result was the environmental crisis we currently face. What is the Christian response to this? 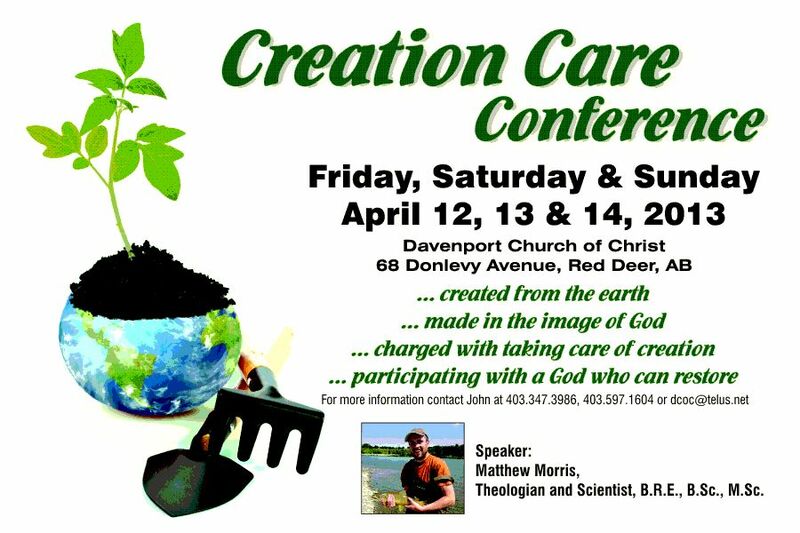 This weekend we are going to explore the Biblical reasons for creation care. Tonight we are going to see that we are creations of God, and as such we share similarities with the rest of creation. These similarities have ethical implications for out treatment of the created world. Tomorrow morning we are going to see that we are fallen creations of God, with one consequence being that our decisions can negatively impact the environment. This will primarily be a science talk, as we explore some areas of environmental degradation. Tomorrow evening we are going to explore how, although we are similar to creation, we are also separate, as the only beings made in the image of God, and we are going to see how this identity reinforces, rather than negates, our calling to care for creation. Finally, on Sunday morning we are going to see that we are the Spirit-empowered Church, and that this means that our work in restoring broken lands is both hopeful and fruitful.